Australia claim their second victory over the 2015-16 HSBC World Rugby Women's Sevens Series after overcoming Canada during a downpour in Brazil. 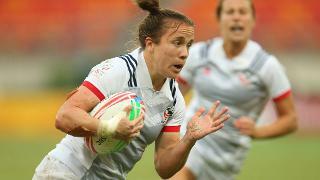 Australia claimed the crown at the second round of the HSBC World Rugby Women's Sevens Series in Sao Paulo on Sunday. 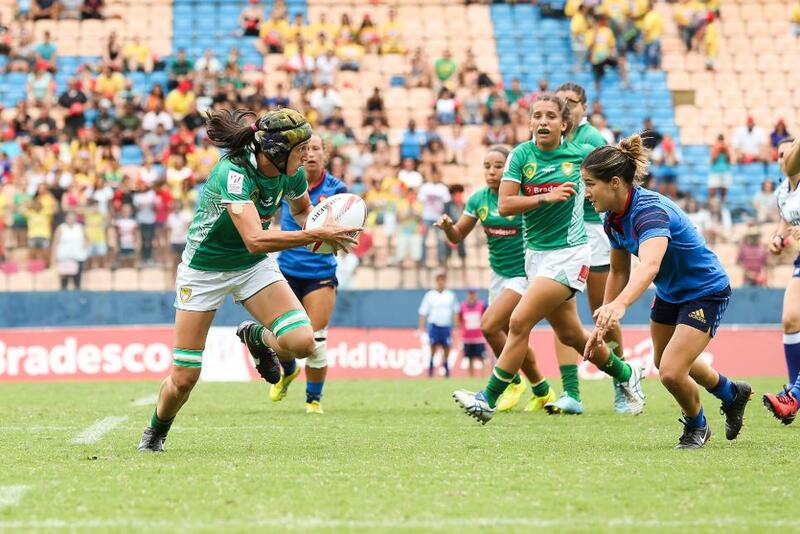 In a downpour in the Brazilian city, Shannon Parry led her team to a 29-0 win over Canada, who had earlier shocked reigning champions New Zealand in the semi-finals with a wonder try from captain Jen Kish. With the Olympic Games looming large in Brazil, the Sao Paulo event saw a samba atmosphere at Arena Barueri where many of the teams who will play in Rio de Janeiro in August set out their stall as the Games edge even closer. Russia beat Japan to win the Bowl, while France overcame Fiji 17-5 in the Plate final. Third place went to New Zealand, who, despite improving on their fifth place finish in Dubai, will be disappointed not to have made the final in Brazil. They beat USA 28-0 in the pouring rain. Recording back-to-back victories in the opening two rounds of the series, Australia's road to their second title was hugely impressive as they showed their full box of tricks and managed the torrential rain in the Cup final. Canada and Australia had each other, and the bucketing rain, to face in search of the title. The elements were hugely challenging but Australia handled them brilliantly and adjusted their game plan accordingly. Two first-half tries from Evania Pelite and Alicia Quirk gave them a great platform and as the time ran down the scores kept on rolling in. With confidence at an all time high, Australian captain Shannon Parry was keeping her cool after the game. "The Canadians really put it up to us tonight. I'm very proud of the girls who put in a solid performance"
"It was really tough and it's Brazil, it always rains at night and I'm glad we put that wet-weather strategy into play and got the win," said Parry. Canadian captain Jen Kish was downbeat after the final, but pointed to the positives. "They are a class act and a good team, but there were too many errors on our part and they took full advantage. But we're a side that's building, we'll focus on (the next round in) Atlanta and we'll continue to build. Winning is totally in our grasp and we believe but we just have to execute." The Cup semi-finals were two enthralling affairs. Early on Ellia Green ignited Australia’s match against the USA and they never looked back, cruising to a 34-0 victory. In contrast, the match between New Zealand and Canada was tense and close. However, Jen Kish’s phenomenal solo score (see video above) just after the break inspired the Canadians to their first-ever victory over New Zealand. The results set up a third place play-off between the USA and New Zealand while Canada and Australia marched on to contest the title. The day opened with the Cup quarter-finals and the first step that every side needed to navigate on their route upwards in the competition. Australia faced Fiji in the first quarter-final and continued where they left off on day one with a comfortable victory. The same could be said for New Zealand’s as they charged to a 41-0 victory over hosts Brazil. In the third quarter-final Canada continued to show the full effect of their power game and it proved to be too much for France to contest with. Finally the USA needed to use every bit of their endeavour to overcome a spirited English comeback and book their Cup semi-final spot. The quarter-final results meant that Australia faced the USA in the first Cup semi-final and New Zealand set up a meeting with Canada to see which two would battle it out for the Cup final. World Rugby Chairman Bernard Lapasset said: "I want to congratulate Australia for winning a thrilling tournament in Sao Paulo this weekend. "Again, we were reminded of the fantastic standard of competition on display in the Women's Series, and how much the teams have benefitted from inclusion in the summer Games. The series takes a break until April, when teams travel to Atlanta, USA (9-10 April) before moving straight to Langford, British Columbia, Canada (16-17 April) for the next rounds of the HSBC World Rugby Women's Sevens Series.